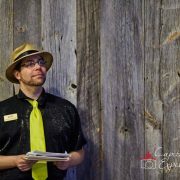 We all know about the amazing eSAX networking events, but how do you find other events to attend while you wait 3 months for each one? Where do you find out about upcoming networking events? There are so many opportunities in every city to help encourage and promote entrepreneur networking. Get involved with a local Chamber of Commerce as they are always a great resource to find out about upcoming events. Go onto Meetup, Pinterest, Facebook, Twitter or Google and type networking events in your city. Or you may wish to contact some of the well-known entrepreneurs in your area because they are probably very well-connected with other networking events that you may not have known about. Don’t stay home and wait for the networking events to come to you. You need to be proactive and find out what’s going on because in many cities there are so many networking events happening around town that you need to pick and choose which ones would be applicable for you and your business. 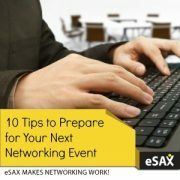 So get out there and keep networking, because #eSAX makes networking work! Do you have a networking question you’d like to ask? 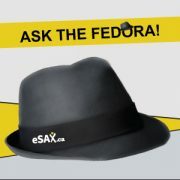 Email info (at) esax.ca or tweet your question using #eSAX! Starring: Jarrod Goldsmith of eSAX and Sax Appeal. With help from Wasim from Storyline Productions and Jessica from Hewett Ripley Communications! Ask the Fedora: Follow Up With Everyone After a Networking Event!